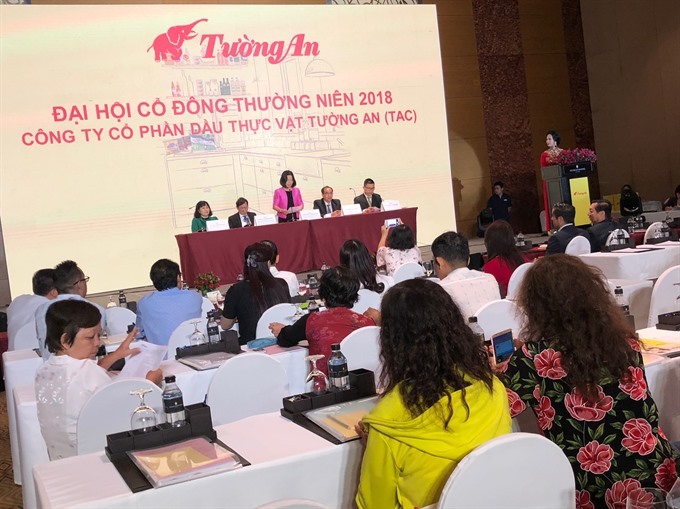 HCM CITY — Cooking oil producer Tường An Vegetable Oil Joint Stock Company (TAC) announced an increase in the dividend for last year to 24 per cent from the earlier plan of 16 per cent at its annual shareholders meeting on April 16. It came on the back of outstanding business results, with pre-tax profits growing by over 98 per cent to VNĐ166 billion (US$7.3 million). Revenues only rose by 9 per cent to VNĐ4.3 trillion ($188 million). The company attributed the results to the strong growth in the economy and the cooking oil market. TAC last year made changes to its product portfolio with a focus on healthy products, she said. Hạnh also hailed the merger with food producer KIDO Group. She said the company was now the second biggest cooking oil producer. The meeting also approved a 24 per cent dividend for this fiscal year. In 2018, TAC targets pre-tax profits of VNĐ250 billion on revenues of VNĐ5.1 trillion ($223.6 million). Hạnh told the meeting that the targets were challenging but achievable since demand remained huge. TAC plans to enter new segments with a focus on high-end products to meet the relentlessly growing demand for healthy products, she revealed. The company would continue to expand its distribution system, she said.